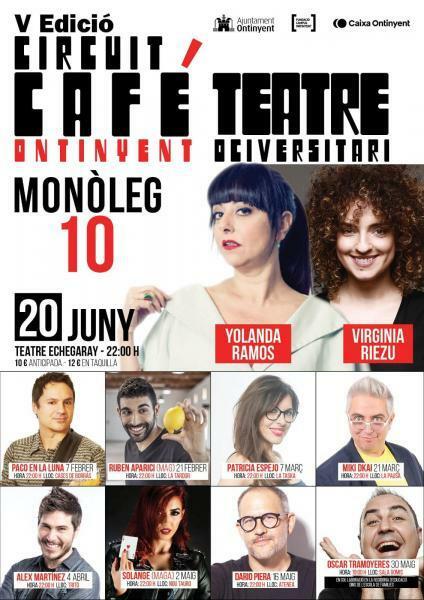 V edition CIRCUIT CAFÉ ONTINYENT "Teatre Ociversitari"
The 5th Circuit Café Theater "Campus Ontinyent-Ociversitari" will offer from February to June a total of 9 shows with monologues, theater, magic and humor. All these will take place at the bars, restaurants and pubs closest to the University Campus, and will start at 10:00 pm on Thursdays. These performances are aimed at students and people wanting to have fun and discover new things. On February 7th, at the Casas de Borrás restaurant, the performance of the monologueist "Paco de La Luna" will take place. Screenwriter of film and TV, comic actor and musician, Fran Ortega takes to the stage a show with monologue, comic song, imitations, parodies and improvisation with the audience under the pseudonym Paco En La Luna. The next performance will be Thursday february 21st at La Tardor with the magician Ruben Aparici, who will present magic with everyday objects with surprising and unexpected results, seeking to create emotions. On Thursday march 7th will be the turn in La Taska for monologue Patricia Espejo, who poses a spectacle of absurd humor from a feminist point of view. On March 21st , Miki Dkai arrives at La Pausa, with a show based on her own experience, in situations that occur daily in her life, with continuous comments of her own with the marked Andalusian character of the artist. On April 4th, Àlex Martínez, comedian of the monologueists València Comedy known for his imitations, will arrive at the Tritó pub. He has been a finalist in the show of monologuistas of Andreu Buenafuente of the program "En el aire" of the Sexta and combines the format stand up comedy with music. On May 2nd will be the turn at the Nou Tauro for Solange, a Portuguese magician and singer specialized in the most difficult category of illusionism: manipulation, making objects appear and disappear with great ease. On Thursday May 16th in Athena will be Dario Piera, who will make a show of intelligent humor, about the environment and daily life. On May 30th will be the performance of Oscar Tramoyeras, one of the most outstanding Valencian monologuists, who will perform in the Sala Gomis. The program will end on June 20th with the show by Yolanda Ramos and Virgina Riezu at the Echegaray Theater.